We paid a visit to Masolino in Castiglione Olona, to study his masterpiece and refresh the dream of Cardinal Branda Castiglioni, who was able to turn a small village into a vibrant cultural hub. It takes less than an hour driving from Milan to reach the little village of Castiglione Olona, where the Collegiate complex, made up of the church, bell tower and baptistery, is located. 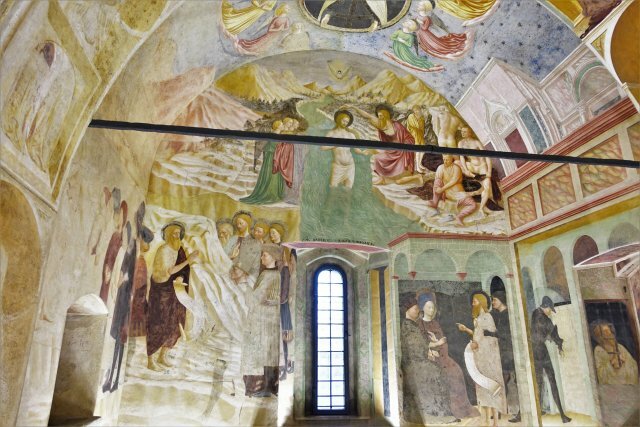 Particularly noteworthy is the cycle of frescoes painted by Masolino da Panicale for the Baptistery. And it’s enough to go back to the introduction of Masolino’s life that Giorgio Vasari wrote to realise the importance of this artist that Cardinal Branda Castiglioni, who was born in Castiglione around 1360, chose for a commission that this refined scholar and art lover really had at heart. Truly great, I believe, must be the contentment of those who are approaching the highest rank in the science wherein they are labouring; and those, likewise, who, besides the delight and pleasure that they feel in working valiantly, enjoy some fruit from their labours, without doubt live a quiet and very happy life. he might have been numbered among the best, since his works are executed with good grace, and with grandeur in the manner, softness and harmony in the colouring, and much relief and force in the draughtsmanship, although this is not in all parts perfect. Masolino is given the commission of the frescos for the Baptistery in 1435. The artist, pupil of Lorenzo Ghiberti, has already worked a lot in Florence, where he also collaborats with Masaccio on several occasions, like in the executions of The Madonna and Child with St. Anne, also known as Sant’Anna Metterza (1424, now in the Uffizi) and of the fundamental Brancacci Chapel in the church of Santa Maria del Carmine, where the two artists work literally side by side – as there is only one scaffolding thus allowing them both to paint at the same time. However, in September 1425 Masolino leaves Florence for Hungary, following count Filippo Buondelmonti degli Scolari, better known as general Pippo Spano, confidant of King Sigismund of Hungary (who appointed him as administrator of all gold mines in the kingdom) and friend of Pope Martino V. In 1427 the artist is again in Rome, where he probably goes back to work with Masaccio on the triptych for the church of S. Maria Maggiore (whose panels are now divided among the National Gallery, London; Museo di Capodimonte, Naples; and John G. Johnson collection, Philadelphia Museum of Art). 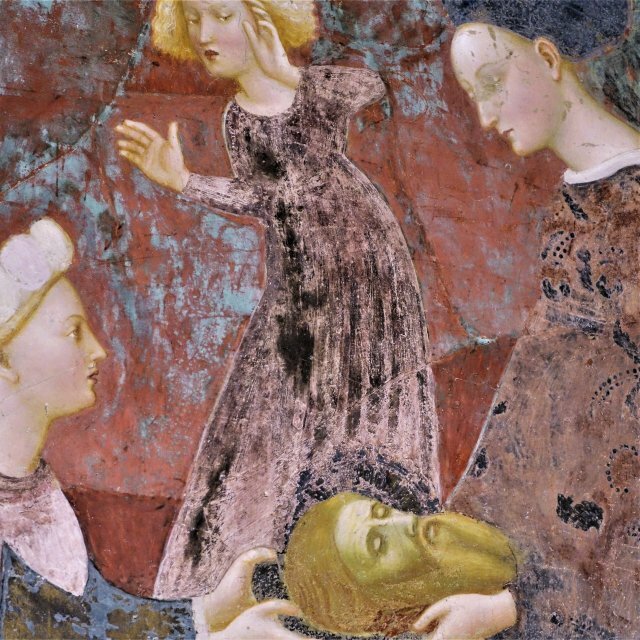 The two artists meet again, and their relationship is rather suggestive – as Roberto Longo writes in his ‘Fatti di Masolino e Masaccio’ published in 1940. On one side there is Masolino, a light and minimal painter, who pays more attention to chromatic values and cleanliness of the lines rather than to naturalism, or to the expression of human motions. On the other side, Masaccio, certainly more expressive and careful about anatomy, yet perhaps less pure and elegant. Sadly though, their confrontation is again postponed, and this time forever. 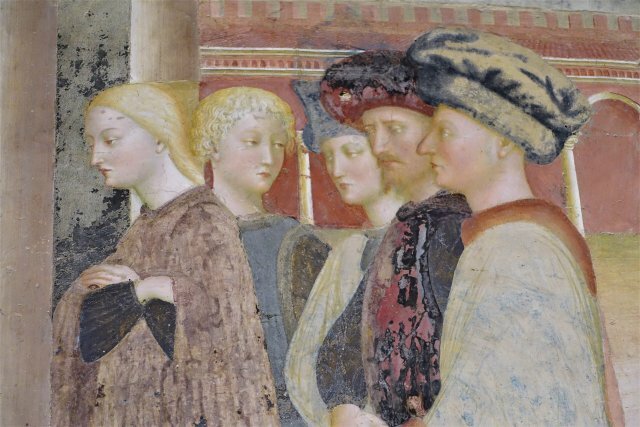 Masaccio passes away the following year and Masolino has to continue alone his Roman adventure, which culminates in the frescos for the chapel of Saint Catherine at San Clemente that artist executes between 1427 and 1430 without any help. This work is commissioned by Branda Castiglioni, who then asks Masolino to come to his native village, on the river Olona, where the Cardinal is creating a spiritual and cultural centre, modelled on the best humanist circles of the time and inspired by the many diplomatic missions the Cardinal undertook for the Holy See. Masolino and the frescos for the Baptistery. Branda Castiglioni commissions Masolino to paint the apse’s dome of the Collegiata church and the walls of the Baptistery annexed to it. On the domes of the former the artist paints episodes from the Life of the Virgin. In the Baptistery Masolino focuses instead on the Life of Saint John the Baptist, placing at the centre of the intimate room the figure of Jesus Christ standing immersed to the thighs in the river Jordan while John baptises him, the Holy Spirit descending on him, and the neophytes putting their cloths back on. Around the baptism Masolino depicts the most significant episodes of Saint John’s life by operating that typical time-slip which moves forward the action to the time the cycle is actually painted. Masolino thus talks in the present tense. The sequence begins from the counter-facade with the Annunciation of John’s birth to his father Zechariah and the Visitation. 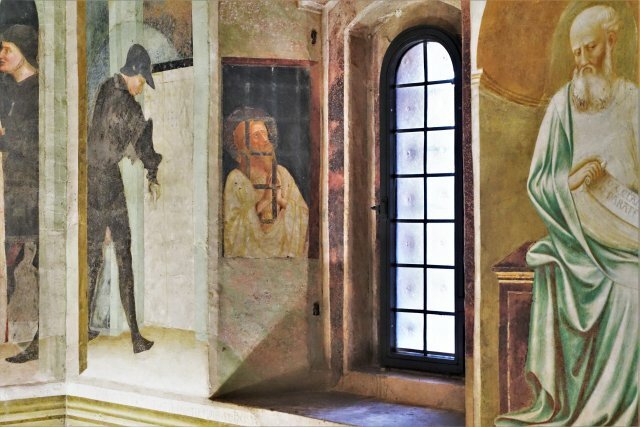 On the left side there should be the Nativity of John the Baptist, almost all lost (this is the wall on the northern side of the building; covered by a layer of lime for a long time, the frescoes have only been discovered in 1843). Then comes the Sermon of the Baptist which reveals in advance the clash he will have with Herod by condemning the king’s relationship with Herodias, widow of Philip, and mother of Salome. As a consequence John is imprisoned and later beheaded. 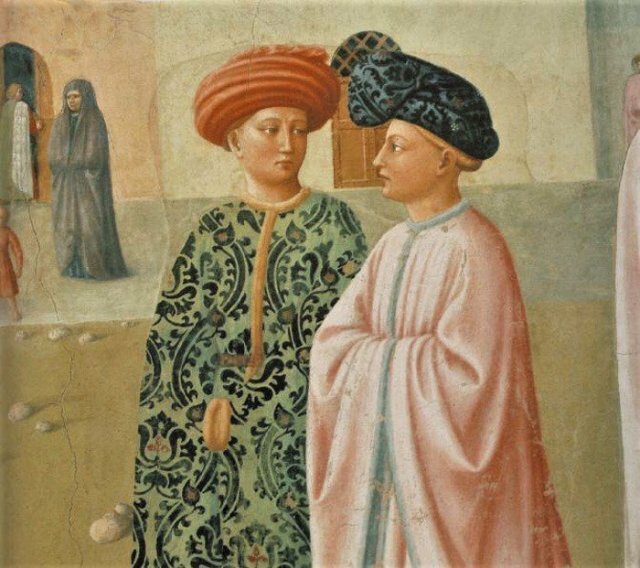 At the Banquet of Herod the background architecture and the same characters closely remind of the formal structure of the Brancacci chapel, from where at least a couple of characters seem to come from. We are in one of the many ideal Renaissance cities of the 15th century, the characters are real people who most likely can recognise themselves in the painted figures. The description is thus ideal rather than naturalistic. The long colonnade on the right, which runs towards the vanishing point – placed close to the head of the figure in the foreground – creates an incredible depth, that is then reflected in the many ‘windows’ scattered along the cycle: the small cave that houses the body of the martyr, dug into the greenish mountain standing out beyond the village; the prison cell where John is held, perpendicular to a real window, also protected by a metal grill; the room from where the death man is coming out, after executing the beheading ordered by Herod to please Salomè’s wish in return for her dance. There is indeed a system of ‘openings’ which revolves around the scene of the Baptism and the figure of Christ who can be regarded as a visual pillar and represents a urban counterpoint to the rugged landscape of Galilee. Everything is happening at the same time, and Rome is solemnly depicted on the counter-facade, in the background, together with the evangelists and the two prophets. Masolino and Branda Castiglione’s programme. Whoever thou are, stop and behold this tomb and read this epitaph. I am the famous Branda Castiglione, I was once a great Cardinal, a fortunate man of noble family and I was admired for my actions and devotion. I lay in this marble tomb, but do not complain my death, as my fame remains eternal. I built castles, decorated altars, ordered sanctuaries to be enriched and greater exploits I would have achieved, but the Almighty called me from the earthly prison.